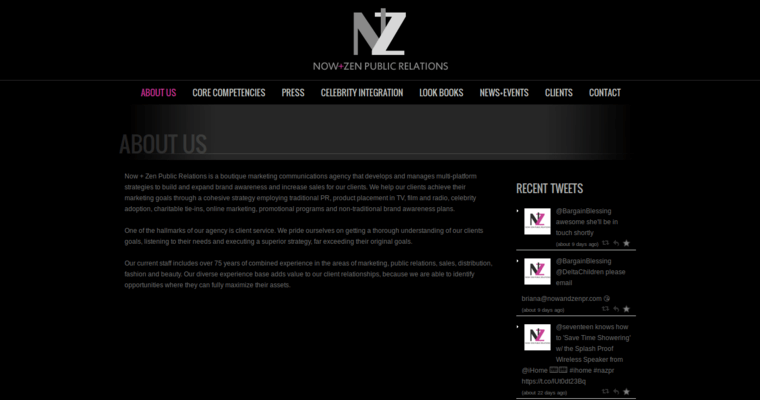 Now&Zen is a public relations business that revolves around the vast fashion scene. The team members at Now&Zen tirelessly construct solid ties. The aim behind these ties is to enable individuals to come across brands that may make positive impacts on them for years and years. Now&Zen is in Midtown Manhattan in New York, New York. It's a marketing entity that takes a boutique approach to all of its services. The Now&Zen crew assists clients with all different facets of product placement, digital marketing and concept creation. These employees devote themselves to public relations techniques that are tried and tested as well. Now&Zen teams up with clients of all kinds. It has clients that are famed. It has clients that are relatively new, too. Examples are LIFE Detergent, Cinzia Rocca, Evve Milano, French Toast, Georgette Klinger, Electric Energy Straws, Therapedic Weighted Products and Endless Summer. Now&Zen accommodates many accessory companies.